The Vektor pickup was developped by German luthiers Tobias Pöhling and Sven Gawron. 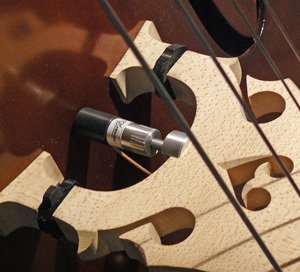 The first version of this contact microphone got permantly installed into to bridge foot. The new improved version of the Vektor pickup gets easily installed (and removed) by means of a screw, which holds the pickup between bridge and top. It picks up the sound directly from the top, and not from the bridge. The Vektor pickup needs 9V phantom power (max.) which can either be supplied by a suitable amplifier or a pre-amp with a phantom power function.